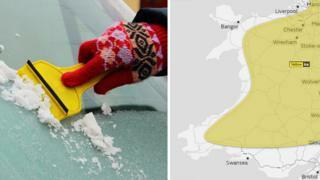 The Met Office has issued another ice warning for most of Wales from 17:00 GMT on Friday to 11:00 on Saturday. The latest yellow "be aware" warning covers all of Wales except Anglesey and coastal areas. It says: "Ice will be a hazard in places on Friday evening and Saturday morning." The Met Office warns of hazardous conditions where wintry showers fall and on untreated roads, pavements and cycle paths.